The evergreen 911 is celebrating its 50th birthday in 2013, and Porsche will be marking the occasion in style with a series of events throughout the year. We thought we'd mark the anniversary, too, by bringing you a gallery of all the important road versions you could buy over the years. During the past 50 years, Porsche has built more than 820,000 911s, and that makes it the world's most successful sports car. It was launched in 1963 to replace the 356, and through five generations, it has continually evolved, grown more popular, and ultimately seen off the cars its maker created to replace is. Don't believe us? When did you last see a 944 Turbo or 928? Exactly. The Porsche 911's heritage comes not only from its success on the road, but also through its racing - and rallying - exploits. From the very beginning it has been at home on circuits all over the world, earning a reputation as a versatile and dependable winner. Indeed, a good two thirds of the 30,000 race victories achieved by Porsche to date were notched up by the 911. Here, then, are some of the most significant 911 variations from over the years. 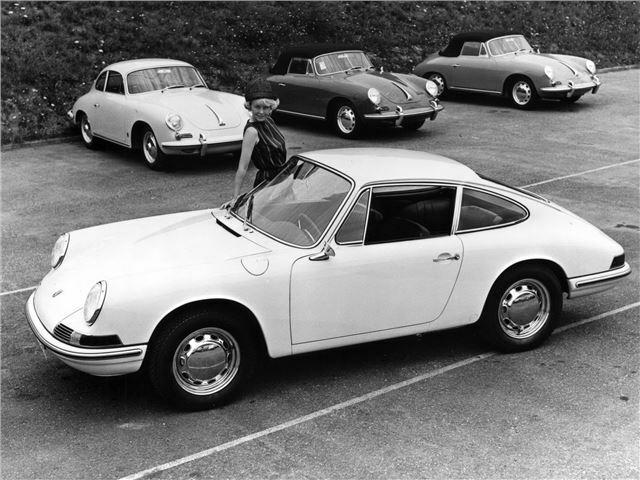 The original Porsche 901 prototype on the eve of its launch at the 1963 Frankfurt Motor Show. It was styled by Ferdinand Porsche's son, Butzi, and created an instant sensation when it went on sale. Like the 356 before (and the Beetle before that), it had an aircooled horizonally-opposed engine, lying beyond the rear axle line. But unlike its predecessors, the 911's engine had six-cylinders, which was part of the reason it was so much more expensive than the 356.